For many years, we’ve heard of various ‘ipon’ (savings) challenges. There are many versions of the challenge, including saving the same amount, spread across 52 weeks or 12 months of the year. Another version is to save increasing amounts of money each week. Another option is to save according to what money you have in your hand, shading the corresponding circles in your guide until you have filled out everything. But most savings challenges are for individuals; this means that you save on your own. Of course, you can do the savings challenge with your friends or loved ones, but always it is about saving on your own and just comparing your savings with others. For 2019, however, there’s a new ‘ipon challenge’ that has gone viral. Financial literacy Facebook page PESO SENSE shared a template of the challenge wherein couples will share one savings goal – and this is to save money together for the entire year. Just like the previously viral alkansiya (piggy bank) template where you shade a circle after saving the money, this one also has a similar rule. But instead of individual savings, you and your partner will each put money inside the alkansiya per week – and both will shade the circle to show that you have already placed your share for the week. If you both can follow through the challenge and save each week, you will be able to save Php68,400 at the end of the year! That’s Php34,200 each. Of course, you can save individually but it would be more challenging and fun if you do it with your partner. Plus, it would be something that could strengthen your relationship as you both work harder to save money for your future. And if you are single and don’t have someone to share the challenge with? 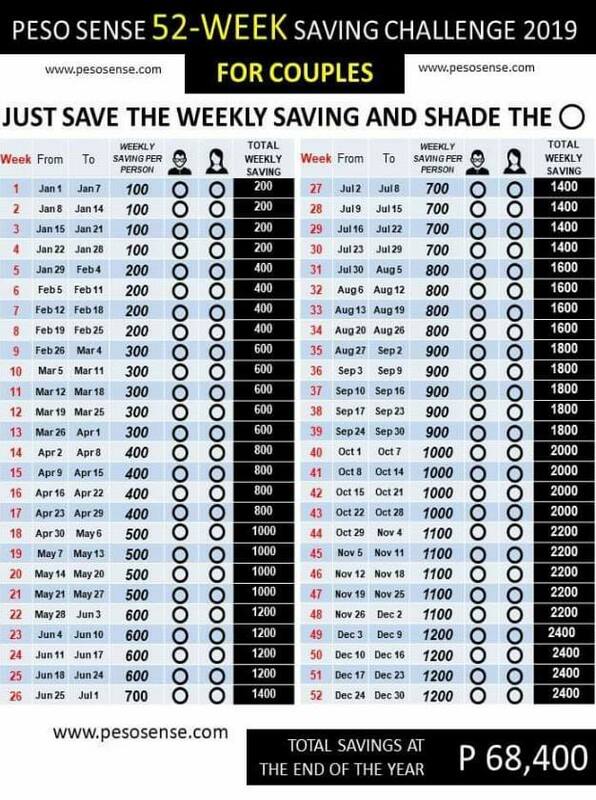 Well, you can choose the original savings challenge or still use this template and just fill the alkansiya twice. Just print the photo above or download the PDF file from PESO SENSE.